Jaw Thrust Brad provides sufficient CPR and lifeguard training while teaching students the jaw thrust maneuver. 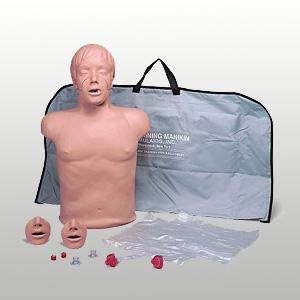 This Brad manikin utilizes the same supplies as the original Brad manikin and encourages harder, more realistic chest compressions. 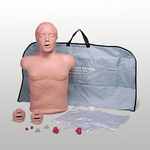 Includes 1 manikin, carrying case, 3 airways and mouthpieces (one set installed). Simulaids Jaw Thrust Brad continues all of the features you associate with Brad. Jaw Thrust Brad utilizes simple moving-parts technology for the instruction of the jaw thrust maneuver. Unique to the industry is the function of ventilating the patient when the proper maneuver is done without tilting the head. New AHA standards encourage you to push harder push faster. This manikin fortifies how hard you must push! The replacement lung systems and face pieces remain the same as the Brad product items so you have the convenience of using the same supplies for both.